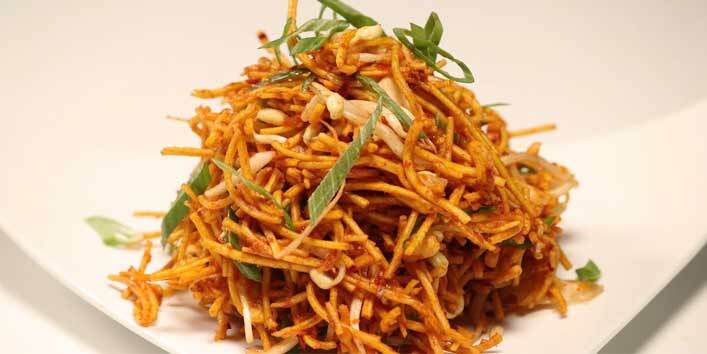 Chinese bhel recipe is a very interesting snack which is a fusion of Chinese flavor with Indian spices. Made with crunchy noodles and fried veggies this appetizer recipe is perfect for the occasions like kitty parties and get-togethers. So, try out this simple snack recipe at home and enjoy with your family and friends. Take a deep pan and boil noodles with 1/2 teaspoon of oil. Once the noodles are cooked, put them under cold water. Now, dust the noodles with some corn flour and deep fry them till they turn crispy. Then, take a pan and add some oil to it. Once the oil is hot enough, add chopped green chillies and onions to the pan. Saute them for a few minutes. After that, add garlic and ginger paste to the pan with chopped capsicum, carrot, and cabbage. Now, add black pepper powder, salt, chilli sauce, soy sauce, tomato sauce, and ajinomoto to the pan. And again, mix all the ingredients. Then, take a large bowl and mix the fried veggies and noodles using a spatula. And your Chinese bhel is ready to be served.